Karl Theobald (born 5 August 1969) is an English comedian and actor, best known as Dr. Martin Dear in Channel 4 sitcom Green Wing, and for his physical comedy style. Karl was also the one-time comedy partner of Russell Brand when they formed their double act Theobald and Brand on Ice in the 1990s. 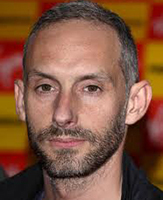 Karl has written comedy for television programmes such as The Sketch Show. He also appeared with Russell Brand in the 2010 film, Get Him to the Greek. The proof of the pudding is in the eating, as they say. Karl’s career spiralled in the comedy and acting world. After leaving The Denes High, he joined theatrical touring companies and he appeared at the Edinburgh Festival in 2001 as a member of the Comedy Zone, he travelled throughout Great Britain performing his one-man show Mr Tinnamen’s Travelling Medicine Show. Karl not only performs, but also writes comedy. For example, he was part of the team who were presented with a BAFTA award in 2002 for Best Television Comedy Series for scripting The Sketch Show. Since The Green Wing, Karl has starred in AD/BC, The Last Laugh, The Virgin Queen and many more. You may recall the BBC Four comic documentary series Twenty Twelve that featured people behind the scenes of the London Olympics – Karl played the part of Graham Hitchins, Head of Infrastructure. Of course, Twenty Twelve received a BAFTA award in the category of Best Sitcom. Karl’s other TV appearances include Doc Martin, Primeval, Skins, Pramface and Plebs. Karl also starred in radio sitcoms such as The Exterminating Angels. This year, Karl finished shooting the independent British feature film Downhill, which is a comedy about four men attempting Alfred Wainwright’s coast-to-coast walk. The film co-stars Ned Dennehy, Jeremy Swift and Richard Lumsden. Karl’s mother, Wendy Theobald is a regular visitor to The Denes, as she is heavily involved with the local sea cadets. If you meet her, you may like to ask her about her famous son!